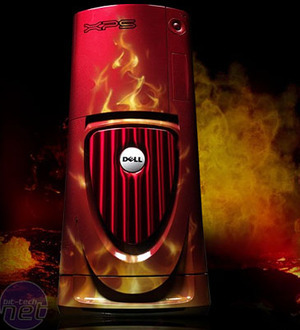 We have just learned that Dell and NVIDIA has unveiled the first-ever Quad-SLI system at the Consumer Electronics Show 2006, out in Las Vegas. After the introduction of the Gigabyte motherboard with four PCI-Express x16 interconnects, we were wondering how long it would be before NVIDIA added support for four video cards to run simultaneously in SLI. 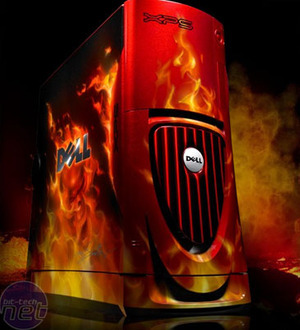 The Quad SLI setup is built into Dell's XPS 600 Renegade system and the system features four GeForce 7800 GTX 512MB GPUs on four custom PCBs that seem to be attached together in two's. They fit into two PCI-Express x16 interconnects on an nForce4 SLI X16 Intel Edition motherboard. 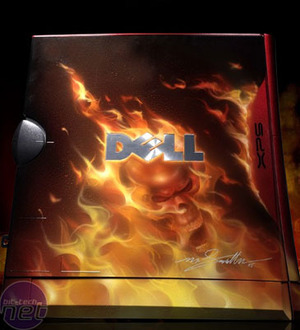 The system comes with an Intel Pentium Extreme Edition 955 processor - overclocked to a mouth watering 4.26GHz - 2GB of DDR2 667MHz memory, a custom paint job by Mike Lavellee and both Mike Lavellee's and Michael Dell's autographs on the finished paint job. The video card subsystem is quite astounding - there is over 41 gigapixels per second of fill rate, 96 pixel pipelines, 32 vertex shaders and 2GB of dedicated graphics memory. As for clock speeds, each of the four GPUs will be clocked at 430MHz - we're not sure of how fast the memory is running at, but we're suspecting that they'll run at 1200MHz - the reference GeForce 7800 GTX 256 clocks. 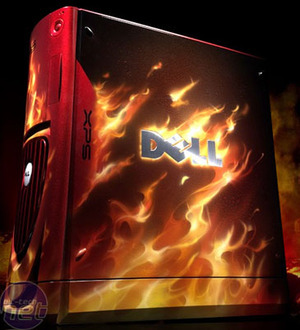 We have no doubts in saying that this machine will be able to enjoy every game out there at the native 2560x1600 resolution of the new Dell 3007WFP monitor. In addition to this, NVIDIA is launching a new 32x SLI Anti-Aliasing mode for this system - many games will be CPU limited enough to make use of these unheard of Anti-Aliasing levels. Discuss these exciting developments in the forums.